Saddle up and explore New Zealand’s rugged wilderness on this 3.5-hour Cardrona High Country pub trail horse-riding trek. Head on horseback into the New Zealand countryside with your guide. Discover points of historical interest along the winding mountain trails, and gain insight into the 19th-century gold rush that brought wealth to the area. Pass through a working cattle farm, traverse choppy rivers and enjoy panoramic views over the rugged scenery. 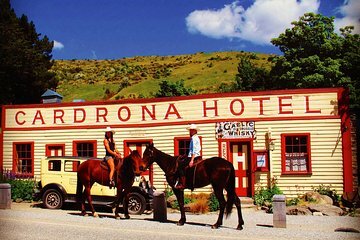 Stop at the historic Cardrona Hotel for a complimentary drink, then return to base along the mighty Cardrona River. Really nice tour with interesting info about the history of the area. Ally was great at talking to everyone and making them feel comfortable and matching them with a horse. There were 4 in our group: one had never been on a horse, one had only ridden twice, and the last two of us had a little bit of experience. Ally gave great instructions and made everyone feel comfortable and confident. We had a nice ride up into the hills with her giving us some interesting details about the area and history. The stop at the historic hotel was a nice break the cider was very refreshing, and then we finished with a canter back to the stables. Tip: There isn't any shade along the ride, so make sure to put on sun lotion!